Houston, TX, May 10, 2017	(Newswire.com) - ​Atlas API Training announced today the expansion of their refinery and pipeline training programs, featuring a combination of both online and on-site courses for greater convenience and retention. Unique in the refinery / pipeline industry, the new Atlas API Training catalog now features 84 courses focusing upon petro-chemical engineering, maintenance and inspection. The courses cover a wide range of topics from drilling to refining. These training courses add significant value to professional credentials. Training helps employees perform in a more proficient and safe manor. This leads to more efficient production and improves the bottom line for a company. In addition to on-site and online training, Atlas will soon be launching live webinar training classes — these can be arranged to accommodate students from several locations at the same time. This prevents the need for costly, time-consuming travel. Students can interact with the instructor in real time. Atlas’s API online exam prep courses now include. API 510, API 570, API 653, API 580, API 1169, and Introduction to Quality Control for Welding. Customized inspection and maintenance of piping and equipment instruction are offered by Atlas as requested by customers. Established in Houston in 2014 by Hannon McLeod and Oran Lewis, Atlas API Training provides online and on-site petro-chemical and power industries exam preparation courses for advanced industry certification. 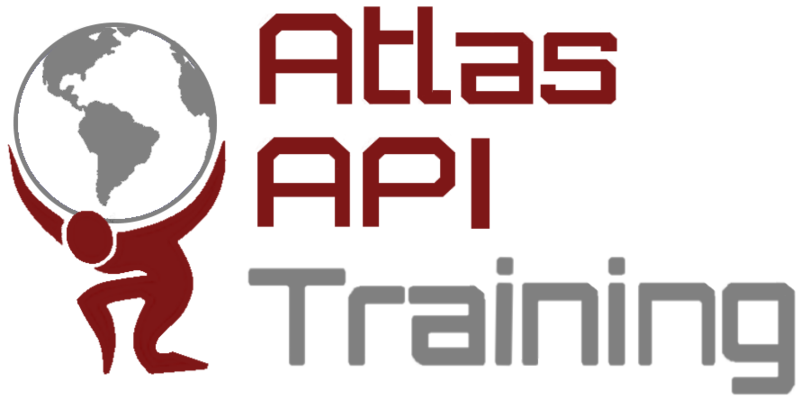 Over the past two years, Atlas has received multiple requests to expand their offering of advanced API certifications and is now developing additional industry specific training courses that will soon be available. Our online and on-site training courses are designed to give students the best opportunity to pass the critical certification exams. All courses are frequently updated to reflect the most current industry specific changes and testing parameters. In the effort to service the ever-increasing demand for onsite instruction, Atlas API Training has also expanded their instructor recruitment program. Contact hannon@atlasapitraining.com.